← Great News About Holmes & the Irish Rebels! The very first talking film that starred Sherlock Holmes and Doctor Watson was The Return of Sherlock Holmes with Clive Brook as Holmes and Harry Reeves-Smith as Doctor Watson. 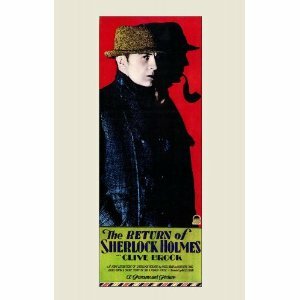 The movie is probably best known as having been the first time “Elementary, my dear Watson” was spoken on the big screen. From that point on its fame goes downhill. Clive Brook does not have the look or feel of Holmes. His long sideburns (not quite as bad as Roger Moore in SH in NY), tweed cap and profile just don’t fit the old mental picture of Holmes. The movie was filmed in an Astoria, Queens, studio that belonged to Paramount Studios. The basic plot is that Watson’s daughter wants to marry a reformed crook who formerly worked for (insert trumpet) Professor Moriarty. In fact, the fiancé has written proof against the Professor. Surprisingly, the fiancé is murdered, the proof goes missing and both Holmes and Moriarty are in search of the paper. The preponderance of the action occurs on board an ocean liner and at different times Holmes assumes the identity of a German musician turned magician and then as a Cockney steward. Neither disguise is very convincing. The movie in general is on a level with the B- films of the third Charlie Chan (Roland Winters). The New York Times review from 1929 is more kind than I am stating “while the film is far from a masterpiece, it arouses a certain amusement and interest, which, due to those portions directed by Basil Deane, the British producer and playwright, make it better entertainment than most murder mystery films.” I must agree with the reviewer’s statements about Watson: “Dr. Watson is no longer the interesting person created by Sir Arthur. He has some of the characteristics, but he appears to have been well adulterated at the Astoria studio… H. Reeves Smith flounders about in the role of Dr. Watson”. 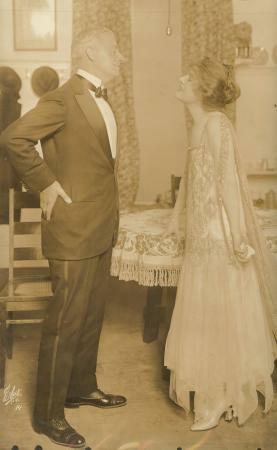 As I said, the most important part of the movie is the fact that it is the first Holmes talkie. Clive Brook is a well-known B movie actor of the early talkies, having come to the states in 1924 to enter the silent films. He was probably a fair choice for Holmes. This entry was posted in Doyle, Holmes, Uncategorized, Watson and tagged arthur conan doyle, Holmes, return of sherlock holmes, Watson. Bookmark the permalink. Thanks for the heads up. I’ll getthat correction in.